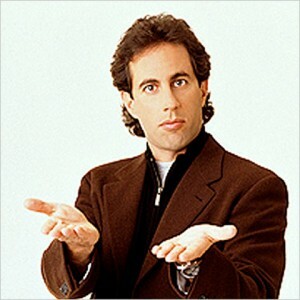 Up some of the night with Seinfeld? I can’t really watch tv anymore, at least not with the same level of enjoyment, because I am always listening out for the baby and when she’s awake she will be crying at some point so I will miss out on whatever is going on. I usually browse through my phone and various internet things like blogs, games – Angry Birds & Jewels – and Kindle books. From tomorrow I will also be browsing through Jerry Seinfeld clips as his website launches with three episodes / clips available per day. Brilliant. This entry was posted in Baby, Video and tagged Jerry Seinfeld, website. Bookmark the permalink.